Camps, A.; Vall-llossera, M.; Batres, L.; Torres, F.; Duffo, N.; Corbella, I. The Soil Moisture and Ocean Salinity (SMOS) Earth Explorer Opportunity Mission was selected in May 1999 by the European Space Agency Earth Observation Programme Board to provide global and frequent soil moisture (SM) and sea surface salinity (SSS) maps. SMOS' single payload is the Microwave Imaging Radiometer by Aperture Synthesis (MIRAS) sensor, an L-band two-dimensional aperture synthesis interferometric radiometer with multiangular and polarimetric imaging capabilities. The definition of the SMOS Level 2 Processor requires the selection of the optimum operation mode (dual-polarization or full-polarimetric) for each application, the specification of the required auxiliary data, and the optimum retrieval algorithms. Using the SMOS simulator and based on the experience gained in previous works, this paper presents a study of the SM and SSS retrieval capabilities over homogeneous pixels, in the two modes of operation with different auxiliary data. It is found that SSS retrievals using the first Stokes parameter measured in the dual-polarization mode perform somewhat worse than using the vertical (T/sub vv/) and horizontal (T/sub hh/) brightness temperatures measured in the full-polarimetric mode, and the performance degrades for cold waters due to the lower sensitivity of the brightness temperature to SSS at low sea surface temperature (SST). Due to the larger angular variation of T/sub hh/ and T/sub vv/, SM retrievals using T/sub hh/ and T/sub vv/ measured in the full-polarimetric mode exhibit a significant better performance over bare soils than over vegetation-covered soils. Over vegetation-covered soils vegetation parameters (opacity and albedo) can be inferred over a 550-km swath width in the full-polarimetric mode. However, since the first Stokes parameter is independent of both geometric and Faraday rotations, it is very robust in the presence of instrumental and geophysical errors. In the SSS retrieval problem and in the SM retrieval problem (with T/sub hh/ and T/sub vv/ measured in the full-polarimetric mode), the performance of the retrieval algorithms tested is not significantly altered if the model parameters are not exactly known, but are left as adjustable parameters in the optimization process. Camps, A.; Vall-llossera, M.; Batres, L.; Torres, F.; Duffo, N.; Corbella, I. 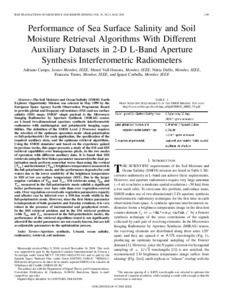 Performance of sea surface salinity and soil moisture retrieval algorithms with different auxiliary datasets in 2-D L-band aperture synthesis interferometric radiometers. IEEE Transactions on geoscience and remote sensing, 2005, vol. 43, núm. 5, p. 1189-1200.